SA-H05 carbine replica by Specna Arms is made largely of a uniform zinc and aluminum alloy, reinforced with steel elements in the most vulnerable points of the replica (steel elements - all the screws, pins and tactical sling swivels). Both the stock pad and the pistol grip were made of polymer. The receiver of the replica and RIS handguard have undergone the process of anodizing, which guarantees a high degree of protection against corrosion. The paint was applied via a process of powder coating, after having the surface undergo the process of sandblasting prior to the application of paint. This provides a much higher than usual resistance of the applied paint to abrasion. The receiver bears manufacturer markings. A reinforced at the cylinder level gearbox contains a steel spring slide that is an element of Enter & Convert™ system and mounted on 8 mm ball bearings and washers steel gears. The system is secured with four anti-reversal latches. A light, made of polycarbonate polymer, piston is equipped with a steel tooth in order to increase its durability. Also, a type 2 cylinder and a steel circuit-breaker, as well as a metal Hop-Up chamber. 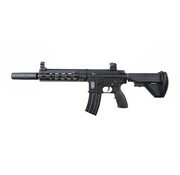 The replica is equipped with a top RIS 22 mm rail, RIS handguard and an adjustable stock. The top RIS rail features metal flip-up iron sights, which can be freely detached in order to make room for the attachment of a chosen optoelectronic aiming device. Due to the extendable stock with an anti-slip stock pad, it is possible to adapt the replica’s length to the body type and preferences of the User. Standard flash hider is based on a 14 mm left-handed thread, which allows the attachment of a silencer in its place. 05 version features a foldable stock on a stock slide. The stock also stores a battery inside. 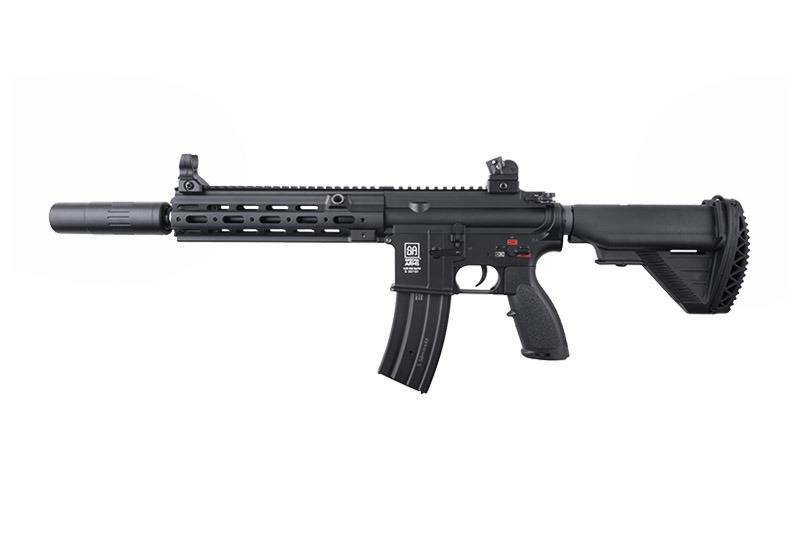 The handguard of the replica has a RIS rail with M-Lock system that allows for individual adaptation of the RIS rail position to the User preferences. The set includes a QD silencer mounted on a 14 CCW thread.